Right now I’m feeling pretty accomplished. I finally sent out my picture book manuscript to potential publishers. Yahoo! I wrote this particular story two years ago. At first it sat quietly on my computer hard drive, but in more recent months the words of this story literally begged for me to take another look. I reread the story and the words filled my head throughout the day while I was at work. When I jogged the main character came alive and painted a canvas for me to see what this picture book could possibly look like. I shared it with some loved ones and when they smiled while they read it my heart sank because that meant only one thing, it was time. I love to write. It’s fun, it’s fulfilling and sometimes the characters I write about come to life and fill my dreams. Truman Capote said, “To me, the greatest pleasure of writing is not what it’s about, but the inner music that words make.” This picture book cannot wait to share its music with others. I smiled and saw how fitting this message was as I felt like quitting. It just so happened that my family spent the night at my house on Christmas Eve. The next morning, my 8 year old niece said, “Tita, I like that message. I have lots of dreams that I’m gonna make come true.” I thought of the sincerity in her words and it reminded me of being on mile 22 on a marathon, almost done but just exhausted. This morning, with my massive headache and bags under my eyes I drove to the post office with my manuscript packets in hand. 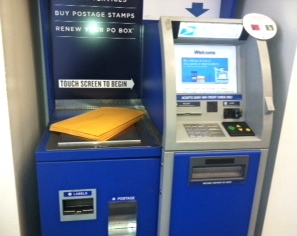 The post office was packed and the people there were grumpy. However, I felt extremely giddy and grateful, like a big kid with a wonderful secret to tell. When I got in my car one of my favorite songs was playing, Vivir Mi Vida by Marc Anthony. “It’s a sign!” I shouted. The best part of this whole experience was coming home and checking this off my TO DO list. 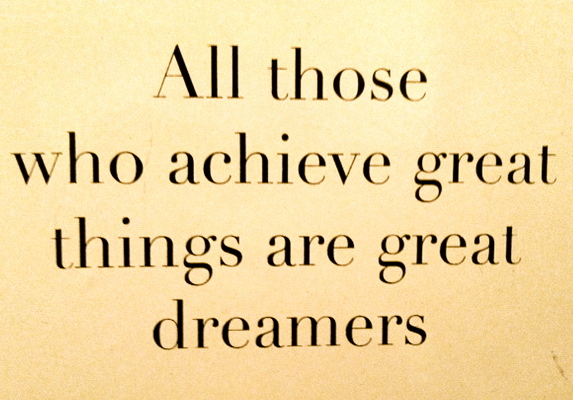 I hope you find the drive and courage to make your dreams come true in 2014. Thanks for being a part of mine. More and more research highlights the importance of vocabulary development and how it is directly tied to literacy, reading comprehension, writing and overall academic success. In a study by Hart and Risely, The Early Catastrophe: The 30 Million Word Gap By Age 3, they find that children from lower income homes not only hear less words per hour, but that they also acquire new words at a slower rate. “Simply in words heard, the average child on welfare was having half as much experience per hour (616 words per hour) as the average working-class child (1,251 words per hour) and less than one-third that of the average child in a professional family (2,153 words per hour).” And while these children were able to learn the new vocabulary introduced to them, they were forgotten or not used in later years. Three years ago, kindergarten and first grade teachers throughout the Lennox School District (where I teach) were trained and coached on Repeated Interactive Read Alouds (RIRA) where vocabulary rich books are read multiple times. During these multiple readings students work on higher level comprehension skills, retelling skills, various language functions by use of sentence frames and vocabulary development from the words found in the text. 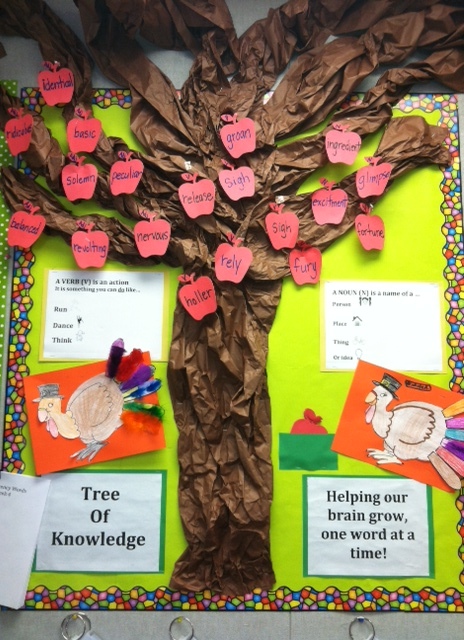 While I personally found writing the lesson plans to be tedious, I did see the value in previewing the book to help students infer, make connections, and to analyze the characters; strategies that great readers possess. 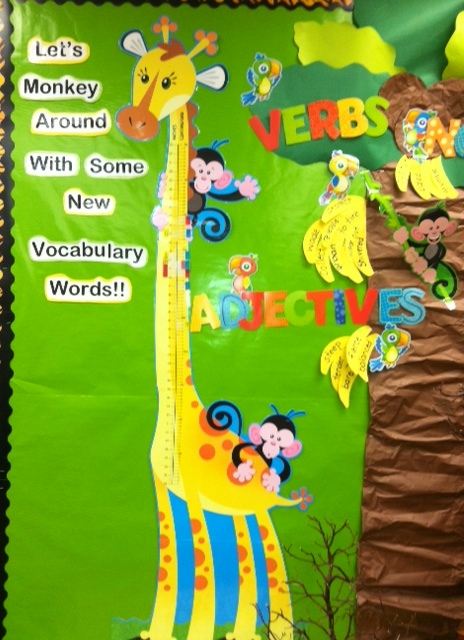 The newly acquired vocabulary words are then placed on a vocabulary wall that are reviewed throughout the week. 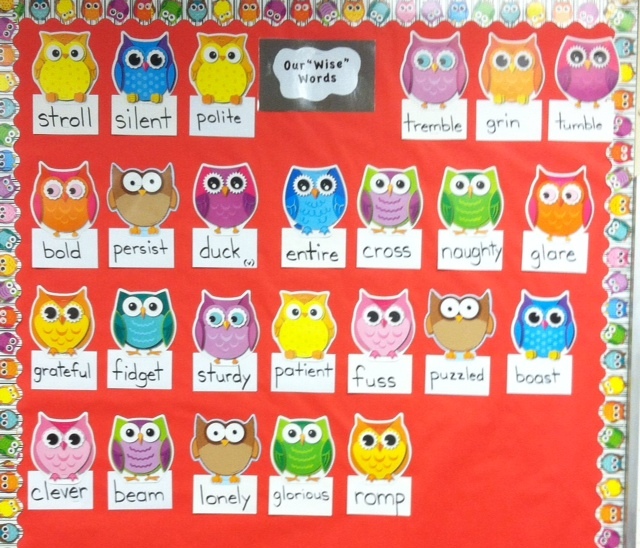 The goal is for students to not just reiterate new words, but to own them and to incorporate vocabulary words into their daily language and writing. In my classroom, when a vocabulary word that has already been introduced reappears in another text, it is pretty exciting to see my first graders eagerly point to the vocabulary wall. Or when a new word comes up during a read aloud and I see that a synonym is already posted on the vocabulary wall I point out these similarities. For example, we came across the word gigantic in a story. I asked if anyone knew what the word meant. Someone said it meant really big. I then asked if there was another word that had a similar meaning. The kids immediately shouted, enormous and I was thrilled! 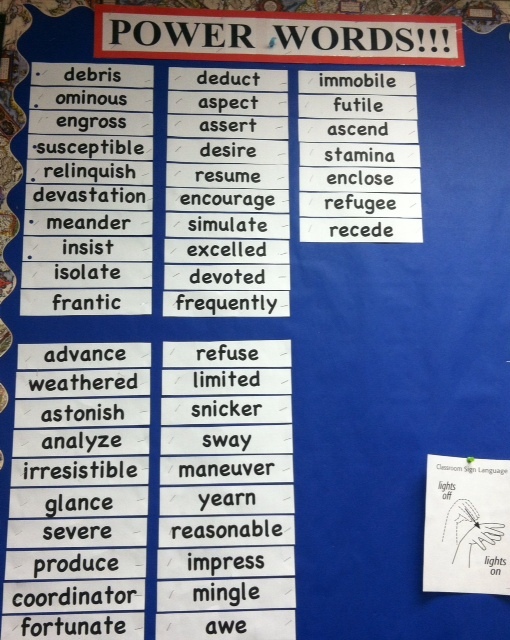 During writing time I am constantly referring to the words on the vocabulary wall as a resource. Just like anything posted in a classroom, it has to be an interactive resource. A constant dialogue must be exchanged between teacher and student and student and student. Otherwise it’s just a decoration to make a classroom look pretty. Lastly, as this picture implies, knowledge is power. Many families in disenfranchised communities are dealing with stressful situations like poverty,unemployment and homelessness. How can one expect for a parent who has never experienced the joy of story time themselves as a child to then do this powerful activity with their own children? How can one do different if no one is showing them another way? All parents want the best for their children, no matter where they come from. It is clear that early intervention models need to start at birth. We need to empower communities in need by providing parent education and early literacy intervention before they get to preschool and kindergarten. I always welcome parent volunteers in my classroom in the hopes that they will indirectly learn something viable to the education of their children. A mom volunteer who comes during the reading block recently said, “Now I understand what you mean when you say read every day. You want us to talk to our kids and discuss the lessons in the book like an adult.” Precisely!